The Croobyar Road catchment covers an approximate area of 2,200ha (agricultural land) and includes the important riparian corridors of Croobyar, Leaneys and Stoney Creeks. These three sub-catchments support the regionally significant Narrawallee Inlet and Burrill Lake Estuary systems. The catchment is predominately cleared farming land dominated by beef, sheep, small lifestyle properties and a large intensive dairy farm. 1. Establish a series of vegetation corridors across the landscape, linking remnant Forest Red Gum and Riparian vegetation, providing shade for livestock and a weed trap for fireweed. 4. Improve sustainable land management through regular education, soil testing and fertiliser management plans, dung beetle releases, pasture and weed management. * Six NRM projects were funded which included the establishment of 2.1km of shelterbelts (2,000 tubestock) and 680m of riparian fencing and 300 tubestock planted. 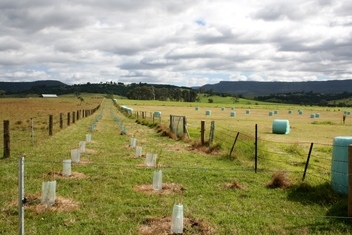 Milton Rocks project funded 27 projects on 14 farms and engaged 22 landholders who manage 60% of the agricultural land within the catchment area. * Organised 4 training events which focussed on pasture, grazing and livestock management - attended by 104 landholders. Click here for a copy of the Project Case Study or view the various project sites below.